Slow growth and wild economic swings mark the investment world in which we live and investment portfolios need balance more than ever. At Hemenway Trust Company, we believe a diversified portfolio of high quality stocks provides the best long-term risk-adjusted returns and will generate a growing stream of dividend income that will far outpace the growth of inflation. We realize stocks are long duration assets and 1) clients have short term liquidity needs and 2) even small changes to expectations on the economy or an individual company can have a major impact to stock valuations. 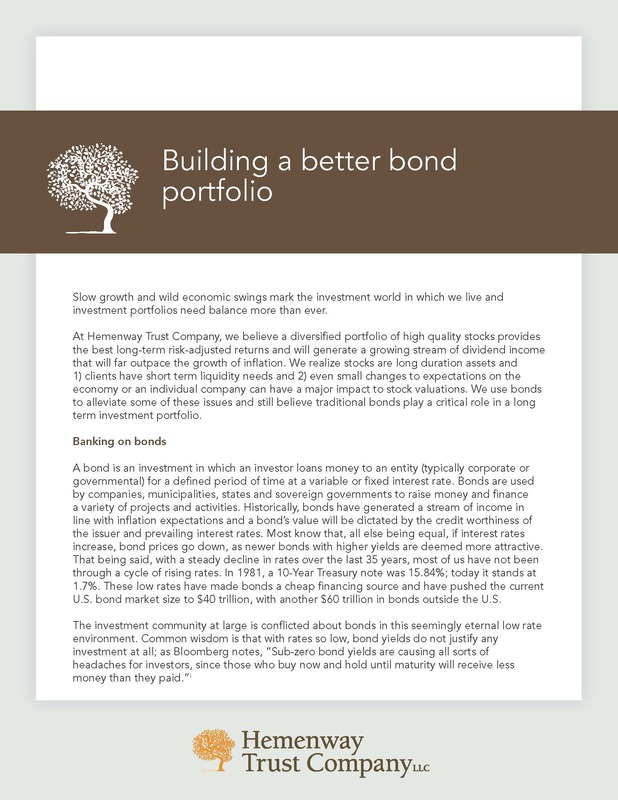 We use bonds to alleviate some of these issues and still believe traditional bonds play a critical role in a long term investment portfolio.